Turtle - Visual Dictionary - Copyright © 2005-2016 - All rights reserved. [img]https://infovisual.info//storage/app/media/02/img_en/019 Morphology of a turtle.jpg[/img] [url=https://infovisual.info/en][/url] - [url=http://www.infovisual.info/]Visual Dictionary[/url] - Copyright © 2005-2016 - All rights reserved. 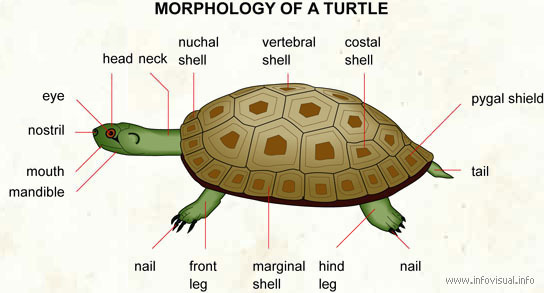 Morphology of a turtle: reptile with an oval shell and a horned beak. It has a very short tail and four short legs, and moves very slowly. Head turtles: foremost part of a tortoise which is attached to the trunk. Neck: part of a tortoise between the head and the body. Nuchal shell: hard plate that forms the shell of the tortoise close to the nape of the neck. Vertebral shell: scale above the tortoises spinal column. Pygal shield: scale situated above the tail. Tail: extension of the spinal column of a tortoise. Nail: nail of a tortoise. Hind leg: rearmost limb of the tortoise. Marginal shell: each of the scales that form the edge of the tortoise's shell. Front leg: foremost limb of the tortoise. Nostril: entrance to the respiratory system. Eye: sight organ of the tortoise. The Wood Turtle was known as "old redleg" owing to the orange or brick-red colour of it legs. The Wood Turtle's aquatic habitat consists of clear rivers, streams or creeks with a moderate current and sandy or gravelly bottom. It spends proportionately more time on the banks of watercourses and in a variety of terrestrial or intermediate habitats than other turtles. Although it uses wooded areas, it prefers more open habitats such as wet meadows, swamps and fields. Wood Turtles overwinter on stream bottoms.